Flat water sailing at it’s trickiest best. 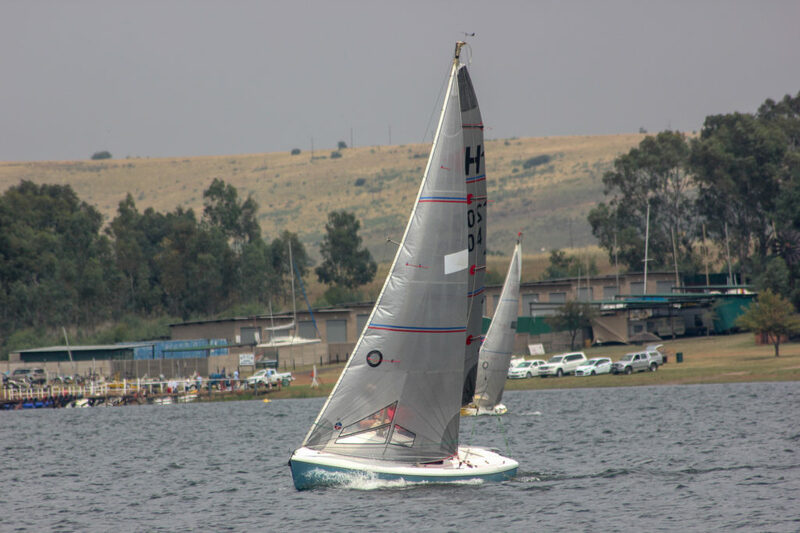 That’s probably the best way to describe the 2019 Hunter National Championships at Witbank Yacht & Aquatic Club over the March long weekend. 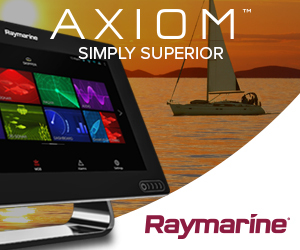 Wind speed light to 8 – 10 knots maximum. We had 16 boats this year, up 4 from last year. One boat from Cape Town, two boats from Midmar Dam and two from the Vaal Dam. There were eleven local entries. 1. 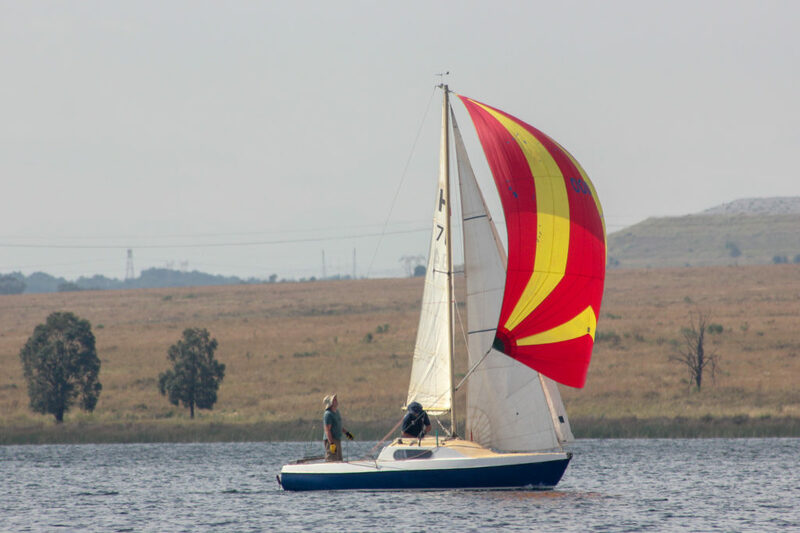 Paul Changuion and Tim Duguid from HMYC decided to take a chance and tow their boat up from Midmar without checking their trailer bearings before leaving. That proved to be an expensive mistake. A mistake that went along way to improving the GDP of the Harrismith Automotive industry. 2. I no longer only consider John Bruckman a good yachtsman, but also something of a master yacht builder/restorer. It took him seven years to strip and re-build Hunter 2004, “Guess Who”. It truly is a masterpiece. 3. Don’t mess with mother nature. On the evening of the 21st we all found ourselves in the middle of a static storm of frightening proportions. 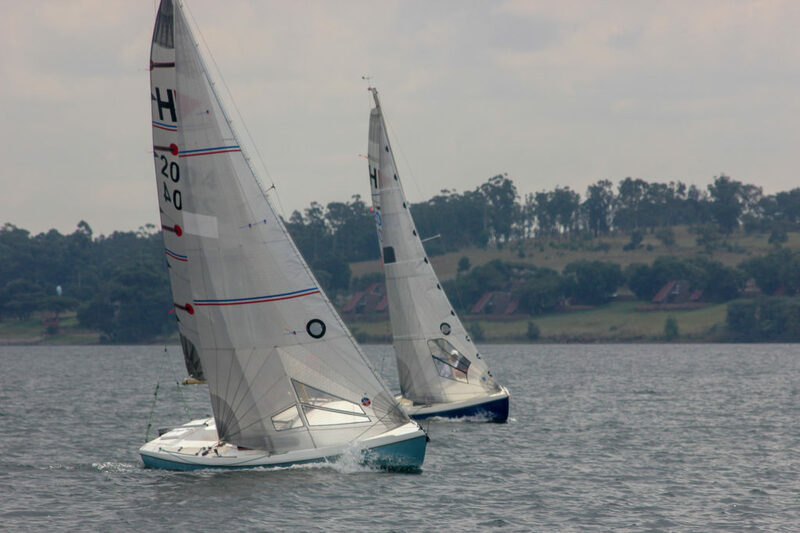 The unlucky recipient of one of the strikes was Pierre Van Rensburg’s boat “Spotty”. What happens is that the lightening strikes the top of the mast and the current exits the boat in three of four places (almost like bullet holes) just above the water line. It’s a slow poison. Pierre and Andrew Edwards didn’t realize they were sinking the next morning until it was almost to late. Thankfully they did manage to get the boat back on the trailer. 4. The Fines evenings were great fun. In the Hunter fleet ordinary seamanship never goes unnoticed. 5. The WEWA sponsored final dinner after prize giving was a grand affair. The galley staff at WYAC have taken yacht club grub to another level. 6. If I may, I’d like to congratulate Barry Ogilvie and myself. We ran the fastest AGM in Hunter Class history – now, if only we could sail our boats that fast. 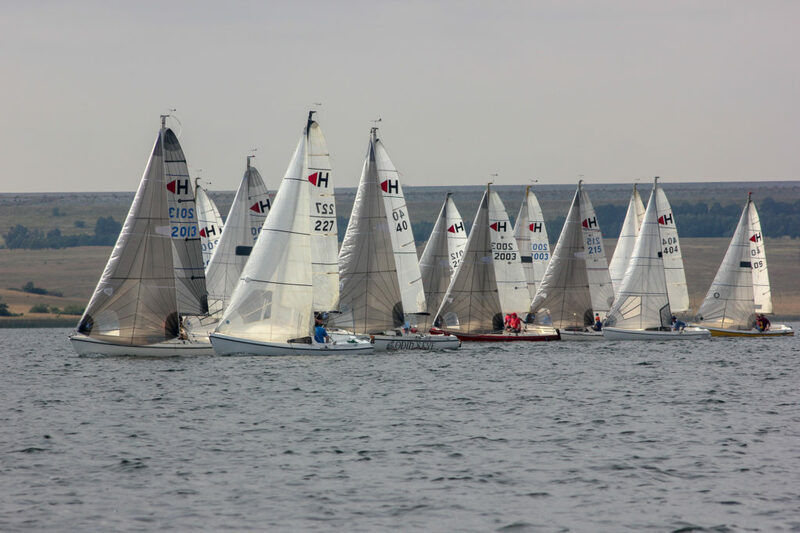 For me this was a regatta that showed why those who spend more time sailing will always be closer to the front of the fleet. 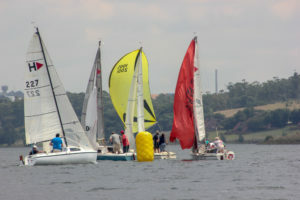 Even though you could go from first to last, and last to first on one leg in the tricky conditions, the top boats always found a way to end the race at the front of the fleet. The sailing was intense. The difference between 1st and 2nd was 1 point. The same between 3rd and 4th. 6 points was the difference between 6th and 10th. 2 points between 11th and 12th and 10 or so points between 13th and 16th. Although much could be said about those at the front of the fleet, I’d like to take some time and comment on what is happening in the middle and the back of the fleet. For the first time in a number of years I got the sense that the standard is starting to improve dramatically. In particular the boats from WYAC are making a much bigger impact. 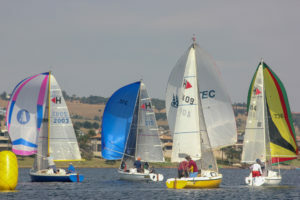 Crews like Steve and Devon Mathews, Pikkie and Zenobia Smit are starting to find themselves at the front of the fleet at times during some of the races. In years gone by this never really happened. Clearly they are spending time on the water and it’s showing on the race course and score board. More importantly the two Witbank boats at the back of the fleet need mention. Corienne and Chloe started and finished every single race of the regatta. To the two of you; well done. 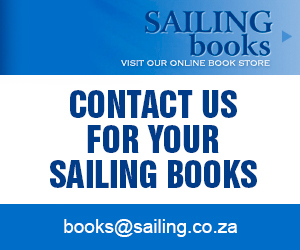 It was not lost on any of us watching you finish your races how your boat handling improved as the regatta progressed. Chris Petzold and Dion Slabbert also started and finished every race. By the end of the regatta it was noticeable that they were starting to challenge the boats in front of them sometimes even passing them. It’s these kinds of performances that drive classes like ours. I’d also like to make special mention of our guests. John and Brendon Latilla joined us from the Trailer Sailor Club of Queensland in Australia. It’s almost a decade ago that they were at one of our Nationals. It was really great to see them again. It was also great to see Mike Hayton around. 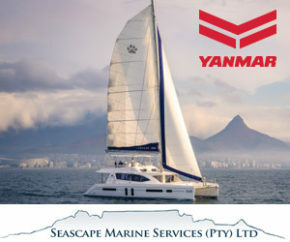 It’s a hell of jump for him come and sail a Hunter after spending the last few seasons sailing his super fast “Nitro” and Cape 31 in Cape Town. These are boats that probably don’t sail at less than 10 knots which provided the impetus for the chirp of the regatta “I don’t think I’ve worked that hard to go 3 knots in my life” (Mike Hayton). Mike had Stefano Marcia of Laser fame sailing with him. It was really cool to have somebody of Stefano’s skill in our fleet. Although they didn’t win the regatta, we could all see that they would be there or there abouts should they give it another go at next years Nationals. Finally, a quick note of thanks to the organising committee and staff at WYAC. It was a superbly run event. Many thanks to Trevor Hulleman, Ron Gurnell and their bridge crew for running an excellent 12 races. 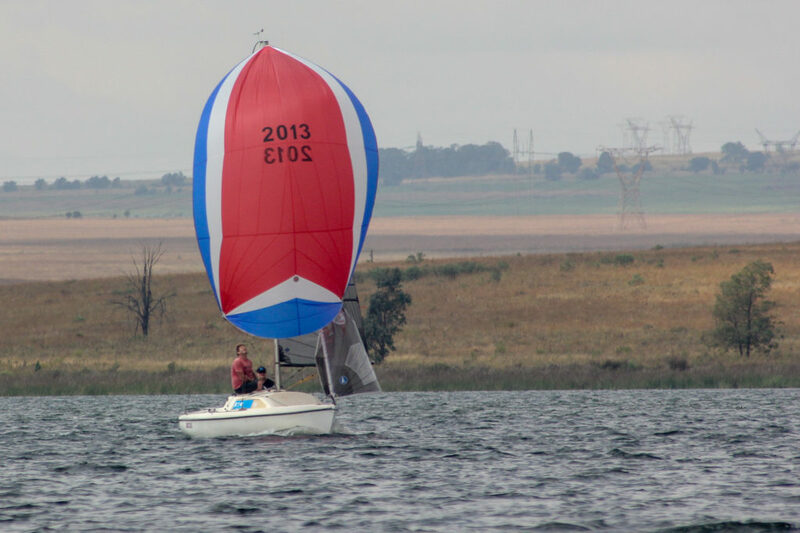 Next year our Nationals will be at the Vaal Dam. Barry, Jessica, Pierre and myself will start making the necessary arrangements and keep you posted on the website and the whatsapp group. 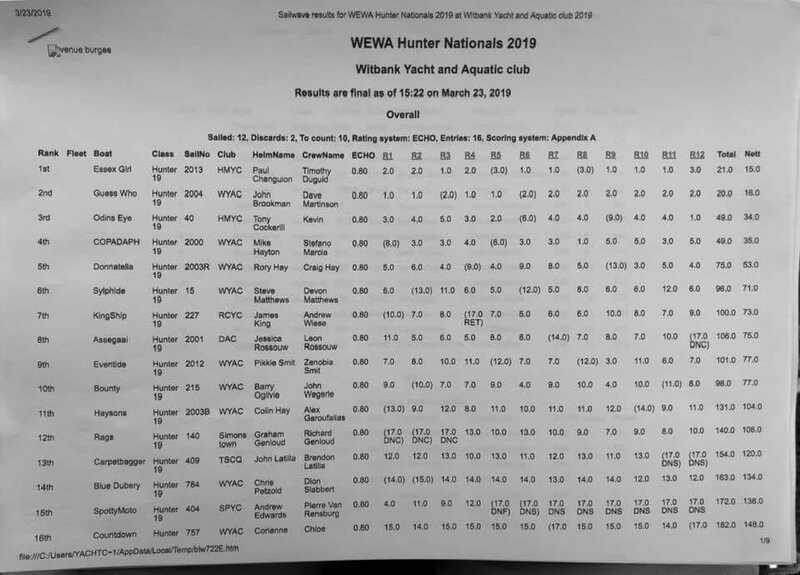 Recently the Hunter Class did a survey amongst some of it’s more recent National Championship winners on what they considered the most important tuning control. “You are presented with a Hunter 19. Hull, complete with keel, rudder with tiller, tiller extension, standing rigging, main sail, genoa and the necessary sheets (including main track & genoa track). I think it would have to be the adjustable backstay. This is the first gear we change in and out of pressure. Off – Lighter Breeze, higher pointing and more power. This does also increase your leech tensions. Some people will also argue that in very light breeze better to have the backstay on hard to help create leech twist and better flow over the sail. I have thought about this quite a lot. 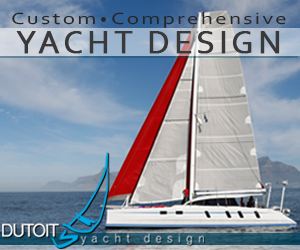 I would add a good backstay control – allowing the forestay to be “eased” when the breeze drops. I initially thought that I would add a headsail cunningham, and came to the conclusion that the backstay control will have similar effect with the added bonus of allowing forestay sag. So yes, a good backstay adjustment. Without them you are going nowhere. I am not sure you would call it a control, but I would check mast position – as this appears to be critical in making your boat go .Especially Europa’s as the early rules had mast position measured from the forestay which in the Europa’s left the mast too far back and plenty of weather helm.